Almost sixty years have passed since Sheboygan was first governed under a city charter, yet in that time there has been nothing done in the way of erecting a building for the use of municipal officers and safe keeping of the city's archives. During all these years the various departments of the city have been relegated to rented rooms in business blocks and at this time several of the city offices are on the second floor of the German Bank building, where each department crowds upon the other, from which confusion and inconvenience ensue. This state of things became intolerable and in the spring of 1912 the question of issuing $75,000 in bonds, for the erection of a city hall, was submitted to a vote of the citizens and was carried almost unanimously. For some years the city has owned a valuable building site on the corner of Center avenue and Ninth street, and here a magnificent $100,000 structure will soon stand, a monument to the progressive ideas of the taxpayers of Sheboygan, and their representatives in the present administration. A systematized, well-appointed fire department is one of the indispensable essentials of a modern city and in this respect Sheboygan is well up to the standard. Protection against fire was early considered by the citizens and along about 1854 or 1855 a hand pumping engine for fires was purchased for the volunteer fire company that had long been in existence. This engine was supplemented by another in 1866 and in 1872 a steam engine was procured, from which period it may be said the present paid department took its start. From time to time additions have been made to the paraphernalia of the department and today it is thoroughly equipped for fighting the destroying element. In 1907, a magnificent central fire station house was built on the corner of New York avenue and North Ninth street, which cost the city $20,000. Here is the office of the chief, Edgar Bedford, the electrician, Samuel Fairweather, and the home of No. i Hose Company, of which John Burkard is captain; also Hook and Ladder Company, No. i ; Henry Traute, captain. No. 2 Hose Company is stationed at the corner of Indiana avenue and South Fourteenth street, Charles Brandt, captain. No. 3 Hose Com- pany has its station at the comer of North Tenth street and Lincoln avenue, Frank zum Buttel, captain. It is certainly food for favorable comment to know that the city prison occupies but a part of a small frame building which bears the name of the police station. The writer visited this bastile one morning recently and discovered no tenant of the cell room. That speaks well for a city of 28,000 people and over one hundred saloons. In 1860, seven years after Sheboygan became a city, there was a population of 4,262. At the start the city had two wards, and they were sparsely inhabited. Today, there are eight wards, which have 26,398 inhabitants, taking the United States census as an authority. The city has gprown steadily and substantially and ranks high in all the attributes of the modern municipality. The people are industrious and prosperous, have high ideals as to mental and physical culture, are a church-going, law-abiding citizenry; and their civic taste for the best in all that goes towards the making up of a high-class community is apparent on every hand. The need of a large police force has never been realized and today the police pay roll of the city is comparatively a small one. The department is made up of twelve men, which includes the chief, August Scheck, a lieutenant, desk sergeant, driver of patrol wagon and day and night patrolmen. The equipment of the department includes a patrol wagon and an ambulance. At present the police station is in a frame building on the corner of Center avenue and Ninth street. On November 16, 1886, the American Water Works & Guaranty Company was granted a franchise by the city council of Sheboygan, to construct a system of waterworks. The works were built and within one year thereafter there were twenty-nine miles of pipes laid by the company and about 250 fire hydrants. By and under the franchise the city was given the privilege of purchasing the plant every five years during the life of the franchise. This privilege was taken advantage of and as early as the year 1899, a committee was appointed by council, composed of F. A. Dennett, Carl Zillier, Henry Luther, Paul Krez and Theodore Dieckmann, "to investigate the feasibility of purchasing the city waterworks and the manner of raising money to pay for the same." This committee was kept in existence until the final act in the project was completed. Prior to the year 1905, the city had made an offer to buy the waterworks, which was rejected and then plans were made by the authorities to build a plant of its own. This lead the City Water Works Company to reconsider the city's proposal to buy and on February 13, 1905, the city was notified that the plant would be turned over to the city on the payment of $360,000 in cash. This proposition was accepted and, in accordance therewith an ordinance was passed by the council, September 27, 1907, for the issuance of $360,000 twenty-year bonds, bearing five per cent interest, payable semi-annually. The city had performed every act imposed by law in the premises. The question of buying the plant had been submitted to a vote of the people and was carried by a vote of six to one. Provision had been made for securing the purchase price and, according to the conditions demanded by the water company, on the second day of January, 1908, Mayor Dieckmann, John M. Steimle, city clerk, members of the City Water Works Commission and the city's legal representatives, met the president of the water company, J. H. Purdy, and the company's secretary, Roy J. Miller, at the place appointed and there notified the company's representatives that the city desired to examine the records of the company, to ascertain if all legal requirements had been observed by the company, in the proceedings for the transfer of the property. This the company refused to do and then the city brought action against the company for specific performance of contract. 1st ward - Yes: 407. No: 128. 2nd ward - Yes: 200. No: 80. 3rd ward - Yes: 109. No: 44. 4th ward - Yes: 327. No: 82. 5th ward - Yes: 404. No: 25. 7th ward - Yes: 275. No: 43. 8th ward, 1st precinct - Yes: 259. No: 34. 8th ward, 2nd precinct - Yes: 415. No: 30. Totals - Yes: 2,634. No: 484. By the election returns it was plain to be seen that the people can do business for themselves when given a chance. They demonstrated, in no unequivocal language, their desire for the waterworks on the terms set forth and by their voice of approval the authorities were fortified and went ahead and closed the deal. Since coming into possession of this valuable utility the city has made a number of changes and improvements. The intake, which had been out in the lake at a distance of i,8oo feet from the shore, has been extended to 5,000 feet and now the intake is at a depth of forty-six feet, on the bottom of Lake Michigan, while theretofore it was at a depth of twenty-six feet. This insures pure, sparkling, ice cold water at all seasons of the year. Another improvement of vast benefit was the construction of an intercepting sewer, from the main sewer on Michigan avenue, which had its outlet directly into the lake, to the Sheboygan river, thus diverting that part of the city's refuse from the lake to the river and by so doing preventing the pollution of the lake water. The city authorities claim the waterworks at the price paid, was a good investment, and that it is an earning proposition that will in a few years pay for itself. That the number of consumers is steadily increasing and the interest on the bonds, which sold at a premium of $2,500, is being met promptly when due and money besides is being constantly placed in a sinking fund for the lifting of each bond when payment thereof is due. The buildings, pumps and mains are in good repair and only one mishap has occurred, that of the falling down, in January, 191 2, of the 140-foot water tower. This will not be replaced, as water is now pumped by direct pressure into emergency reservoirs. A well-devised, properly constructed sewerage system is essential to the health and well being of a community, especially given over largely to manufactures. Sheboygan has many factories of various descriptions, which require an outlet for refuse matter that continually accumulates in large quantities. Business establishments and residences cannot be kept in good sanitary condition, unless properly arranged with outlets for waste fluids that contaminate and breed disease. To meet the needs of a growing city a system of sewage was inaugurated here in 1889, which combines for storm and sanitary purposes and needs. And, the natural topography of the land admitting of splendid drainage, the system in Sheboygan can be well said to be almost perfect. The first sewers were built on Jefferson avenue and North Eighth street in 1889, and since then the city has been cobwebbed with drains, varying in sizes from 4x5 feet concrete sewers to eight-inch pipe. At this writing there have been laid approximately fifty miles of sewers, at the approximate cost of $450,000. These sewers have for their outlets Lake Michigan and the Sheboygan river. Sheboygan is a city of beautiful and well-paved streets and in 1912 many more of the thoroughfares will be curbed and paved in a substantial manner. The first paving done in the city was in 1890 and was constructed of cedar block, on a plank foundation. This work was done on North Eighth street from Jefferson to Michigan avenues, but in 1906 the cedar blocks were removed and replaced with brick on a concrete foundation. To date (1912) the amount of brick paving in the city is fifteen blocks; cedar black, fourteen blocks; concrete, twelve blocks; macadam, one hundred and fifty blocks, or in all, 326 blocks, which cost the taxpayers approximately $600,000. For the information on paving and sewage the writer is indebted to C. U. Boley, city engineer and member of the board of public works. The first hospital and the only one in the city is St. Nicholas, the building of which was thrown open to the public May 9, 1890, and to Rev. Father Thill, pastor of Holy Name church, and others, may be given the credit for its inception and completion. The first quarters of the institution was a brick building at the comer of Superior avenue and Ninth street, owned by a retired priest. Father Strickner. It was commodious and serviceable, and the Working Men's Aid Society, which had taken the initiative in promoting the enterprise and who had raised the first money through entertainments and other means, was soon satisfied that their worthy labors had not been in vain. On the date herein mentioned, four Catholic sisters of Springfield, Illinois, took charge of the hospital and from that day to the present the institution has proved a real boon to Sheboygan and vicinity. It was not long, however, before the capacity of the building was taxed to its utmost, so much so that a larger building was considered indispensable. By 1907 a handsome three story structure built of red brick, was erected and was formally opened in February of that year. And through the munificence of business men and big-hearted citizens of Sheboygan, the various wards in the hospital were furnished. The furniture dealers donated articles for the halls. The Phoenix Chair Company and the Woman's Charity Qub made valuable contributions and through the officers of the Catholic Charity Club an attractive gprotto was placed on the hospital grounds. Others who donated to the furnishings were: Northern Furniture Company, in memory of Walter Liebl; the C. Reiss Coal Company, Woman's Relief Corps, Sheboygan Chair Company, Thomas McNeill, Knights of Columbus, Catholic Knights of Wisconsin, Catholic Foresters, Dr. O. J. Gutsch, Gustav Huette, Mrs. Clemens Reiss, Jennie Mead Circle, King's Daughters, T. M. Blackstock, William Braasch, in memory of George End; Mrs. Herman Schreier, H. C. Prange Company, St. Elizabeth's Ten, Crocker Chair Company, Barrett & Dennett, Mrs. Dr. Fiedler, of Eaton, Wisconsin, in memory of her mother, Mrs. Morris ; Silver Cross Circle, M. Winter Lumber Company, the Mueller Limiber Company, Art Furniture Company and the Parlor Furniture Company. The city has for many years owned and maintained a cemetery - Wildwood - on Wildwood avenue. The original plat covered about forty acres, to which has been recently added another forty acres. The grounds are well kept and are among the beauty spots of the city. Other cemeteries are the Catholic, North Tenth street and city limits; Hebrew, Upper Falls road; Lutheran, west of extension of North Eighteenth street; St. Peter Claver, south end of South Twelfth street. As to sidewalks of Sheboygan, the miles and miles of them have not been accurately computed. Suffice it to say, practically all of them are of concrete and well made. The days of plank and brick sidewalks are numbered. Sheboygan has an opera house in which her citizens take a great pride. It is a beautiful building, both from an exterior and interior view-point, and cost the subscribers to stock issued $45,000. It is conveniently located, on the corner of New York avenue and Seventh street. This play house was opened November 3, 1903, under the management of W. H. Stoddard, who presented to an admiring public "The Burgomaster," in one of the prettiest theaters in Wisconsin. The Majestic theater was built quite recently and the house is an ornament to North Eighth street. While its stage is arranged for acting by people in the flesh, the attractions to a large patronage are entirely of moving pictures of a high order. There are other moving picture houses in the city of lesser importance. 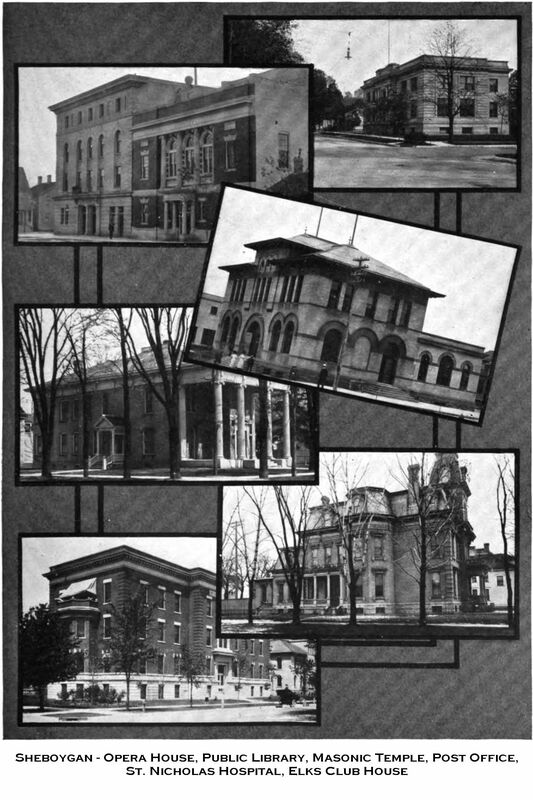 One of the earliest successful efforts to organize a public, or semi-public, library in Sheboygan was that of the members of the First Congregational church, who gathered together about seven hundred volumes of standard and miscellaneous literature for the church library and the general use of the public. 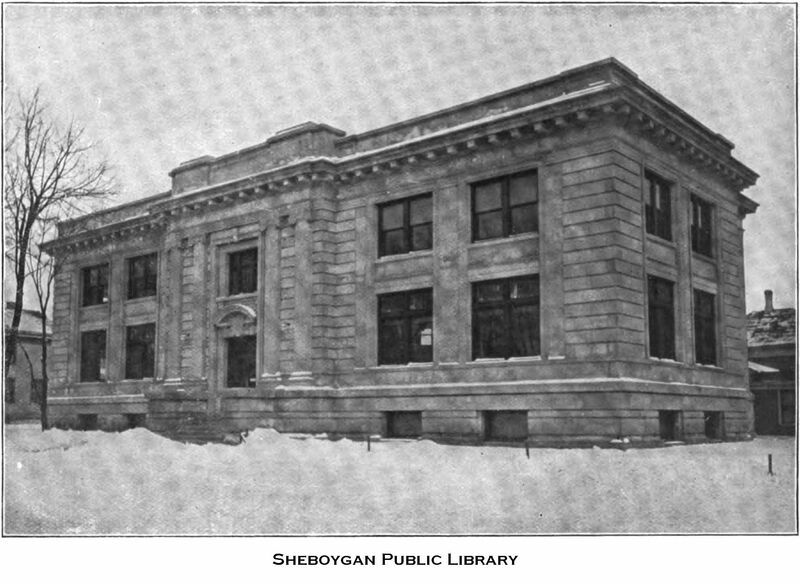 This library was transferred to the Sheboygan Library Association, a corporation chartered in 1880, the first officials of which were: William H. Seaman, president; George End, vice president ; L. D. Harvey, secretary; A. Rabe, Jr., treasurer ; Frank Stone, librarian. One hundred and twelve shares of stock, at the par value of ten dollars each, were sold and the innovation started out with bright prospects and a collection of over one thousand books, which with the periodicals and daily papers gave to the reading public a long-felt want. The present public library had its commencement in the summer of 1897 when the common council appropriated for the support of a library for the ensuing year the sum of $1,316. Under the law the mayor then appointed a board of library directors which organized July 12, 1897. Library rooms were obtained in the Foeste building on North Eighth street, and an active canvass was made to obtain funds for the purchase. This canvass resulted in obtaining $1,474 ^^ subscriptions, of which about $800 was obtained through the efforts of the Woman's Club. Miss Mary E. Gale was employed to install the library and Miss Katharine Buchanan was employed as the regular librarian. In March, 1901, Mr. Carnegie, in response to a request made by F. A. Dennett, offered to give $25,000 for a library building if the city would appropriate $2,500 annually for the support of the library. The common council passed a resolution in May, 1901, accepting Mr. Carnegie's gift and providing for the annual appropriation required. When the board of directors called for plans it was found that $25,000 was too small an amount with which to construct an adequate building, and Mr. Carnegie was asked to increase his gift to $35,000. This he agreed to do in March, 1902, upon the city increasing its annual appropriation to $3,500. Patten & Miller, of Chicago, were employed as architects and in July, 1902, their plans for the present building were accepted. Bids for the building were opened September 10, 1902, and the contracts were let a few days after. The building with all furniture and book stacks cost about $500 more than the amount given for that purpose by Mr. Carnegie. The first board of directors was composed of A. W. Pott, Paul Reuther, O. B. Joems, M. R. Zaegel, E. H. Sonnermann, Ernst Aldag, W. H. Gunther, George Heller, Henry Schilder and Francis Williams. In 1899 Mr. Heller, who held his position by virtue of being superintendent of schools, resigned as such superintendent and the new superintendent, H. F. Leverenz, took his place on the board. In 1902, Messrs. Zaegel and Sonnemann resigned and Messrs. Carl Zillier and Thomas McNeill were appointed in their places. Carl Zillier is at present, president of the board; Francis Williams,' secretary. The librarians have been: Katharine Buchanan, from the organization to May, 1900 ; Bertha Rombauer, May 1900, to April, 1901 ; Bertha Marx, April, 1901, to the present time, 1912. The Carnegie Public Library building is plain though pleasing in its architectural lines and stands on the corner of North Seventh street and New York avenue. The formal opening of the handsome structure occurred Saturday, January 30, 1904, and was attended by appropriate and impressive ceremonies. This public institution, made possible by the generous benefaction of the great iron master, is the pride of Sheboygan and its citizens are generous in their patronage. The library shelves now contain about 13,000 volumes. 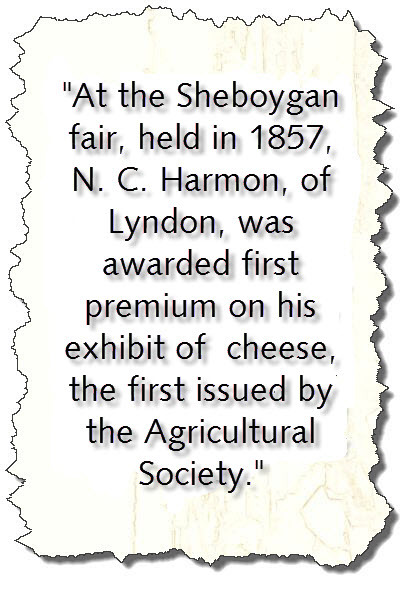 The first organization of business men of Sheboygan, for the purpose of advertising the virtues and beauties of the city and attracting thereby industries and inhabitants, known to the writer was the Sheboygan Business Men's Association, which was organized and incorporated in September, 1885. The officers were: President, H. S. Barrett; vice president, J. M. Kohler; recording secretary, J. D. Steams; corresponding secretary, Francis Williams; treasurer, W. J. Rietow; directors, Carl Zillier, W. H. Seaman, J. L. Mallory, G. B. Mattoon, J. T. Dillingham. The members were as follows: Carl Zillier, W. J. Rietow, H. A. Barrett, J. G. End, William H. Seaman, G. L. Holmes, Thomas McNeill, Emil Clarenbach, W. D. Crocker, R. E. Crocker, J. D. Steams, E. E. Pantzer, J. T. Dillingham, George Heller, E. B. Garton, M. H. Wilgus, John Bodenstein, Adam Imig, George End, E. Lohmann, Henry Scheele, Jr., William Schrage, J. J. Hanchett, C. H. Roenitz, R. W. Billett, O. E. Sully, D. Jenkins, Jacob J. VoUrath, A. J. Vollrath, J. L. Mallory, D. Gibbs, Frank Williams, Felix Benfey, W. H. Gunther, J. M. Kohler, William Elwell, William S. Elwell, Julius Kroos, H. N. Ross, George E. Frost, F. Oetking, Jr., J. Mallmann, F. Lawrence, F. Geele, C. Wolf, E. L. Debell, John Gerend, W. H. Burk, V. Detling, C. B. Jones, O. E. Karste, R. S. Elwell, M. R. Zaegel, A. Bachmann, A. F. Lebermann, Thomas O. Stearns, V. J. Luin, J. H. Mead, W. Calhoun, Clark Putnam, George B. Mattoon, F. L. Roenitz, Carl Muth, John R. Riess, C A. W. Vollrath, William Braasch, E. G. Haylett, J. DeSmidt, Joseph W. End, Christian Ackermann, Emil H. Keller, W. C. Thomas, William Geele, Charles Grasse, John Thompson, A. D. Crocker, G. A. Bettelhauser, A. D. Barrows, O. H. Clark, Arthur F. Winter, J. C. Hoch, T. M. Blackstock, Michael Winter, E. J. Stewart, Albert H. Wright, Charles W. Kneevers, Frederick P. Reiss, Christian Eckhardt, E. H. Ruemmele, W. Kunz, J. O. Thayer, John Stehn, Frederick Hoppe, G. J. McGraw, M. C. Patten, A. L. Weeks, Jr., John Griffith, Nathan Cole, M. Bodenstein, John M. Saeman, H. W. Trester, E. P. Ewer, Jacob Imig, W. T. Davis, E. R. Richards, William Weeks, C. Reiss, Frank Flath, Charles Whiffen, C. Imig, J. Mogenson, H. von Kaas, H. D. Otten, W. D. Halsted, L. K. Howe, J. L. Hart, P. Baltz, Stewart Conover, F. Pape, E. Nehrlich, G. C. Cole, Frederick Karste, Otto Foeste, Otis Clark, J. Shufflebotham, R. Q. Johnson, O. Mattoon, A. O. Smith. In 1909, after a lapse of some years, the association was reorganized under the old name, and William A. Pfister was elected president, and Otto Aldag, secretary. These gentlemen are still performing the duties of these offices and the association, being alive to the virtue of advertising and continual advertising, is doing some valiant work in acquainting the business world with the many advantages of Sheboygan and offering inducements to worthy enterprises to come to the city and set up their stakes for a permanent abiding place. The membership of the^association is large and enthusiastic for anything good that will "boom" Sheboygan. The mails to Sheboygan were first brought here by what may be justly termed a rural mail carrier, who trudged afoot the entire distance from Green Bay to Chicago, with his pack upon his back, accompanied by an Indian guide. The round trip consimied two months' time and the mail carrier was paid $60 a month for his services. The mail route at that time, the early "thirties," was an Indian trail, that only hit the lake in but three or four places between Green Bay and Chicago, Sheboygan was one of them. The post office at Sheboygan was first established between 1836 and 1839, being changed from Brown county and named Chebowagan. On April 18, 1836, William Paine was appointed postmaster at Chebowagan, the name of the office being so designated by the department at Washington. Paine took care of what little mail arrived in the settlement until July 21, 1836, about three months, when his successor was appointed, in the person of Joel S. Fisk, who served until November 25, or four months, and then Charles D. Cole took up the arduous duties of handling "Uncle Sam's" business. Some time between the years 1836 and 1839, not exactly shown by the records of the postal department at Washington, the name of this office was changed from Chebowagan to Sheboygan and has ever so remained. Jairus Rankin, June 7, 1845; Elias H. Howard, August 31, 1847; Edward Oilman, January 18, 1849; George W. Gillett, December 21, 1849; Warren Smith, February 24, 1853; Alfred Marschner, February 4, 1857; John J. Brown, April 17, 1861 ; Alfred Marschner, September 20, 1864; William W. King, June 8, 1869; J. L. Marsh, December 11, 1873; Nathan Cole, September 23, 1882; Carl Zillier, August 9, 1886; William J. Mallmann, December 23, 1890; Carl Zillier, January 10, 1895; C. H. Maynard, February 15, 1899; Edith L. Maynard, June 18, 1903; Edward B, Mattoon, January 13, 1908. He died May 26, 191 1, since which time his widow, Mrs. Emma G. Mattoon, has been acting post mistress. Many changes have taken place in the manner of handling and transporting mail, since the first post office was established at Sheboygan. Trains, that travel over massive steel rails, at the rate of sixty miles an hour, arrive in the city daily and more than one of them at that. In the pioneer days a letter was not carried for less than ten cents and often the charges were as high as twenty-five. This was demanded before the delivery of the precious document. Finally, the government established a system of mailing stamps and later additional mailing facilities in the way of penny postage - the postal card. Today, the farmer, as well as the merchant, has his mail, including the daily paper, brought to his door, city mail carriers being first started on their rounds while Carl Zillier was postmaster, in the '80s, there being four carriers at first. Now there are seventeen. A few years later rural free delivery routes were established and at this time five branch out from this city. A splendid federal building was erected in 1894, at a cost of $32,000, to which an addition was placed, in 1907, costing $26,000. In 1911 a postal savings bank department was inaugurated at this office, which is meeting the anticipations of its projectors. The amount of business has increased from year to year and this condition has continued even up to the past fiscal year, when the office showed the gratifying amount of $69,650.75. In the year past the office issued in money orders $113,269.47 and paid out on money orders presented, the sum of $100,888.23.